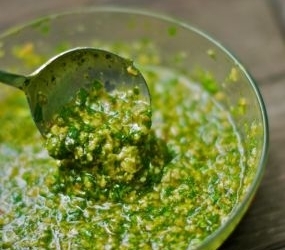 Beef Marinade is a Cambodian Food Recipe with cilantro and mint. In a large bowl, stir together the green onions, lemon grass, cilantro, mint leaves, lime juice, fish sauce, chili sauce and sugar until well combined and the sugar is dissolved. Adjust the flavor, if desired, by adding more sugar and/or fish sauce. Marinate beef over night in refrigerator.